Snowpacks are vanishing at record speed. This points to dramatically reduced river flows across B.C., Alberta and Saskatchewan in the near future. 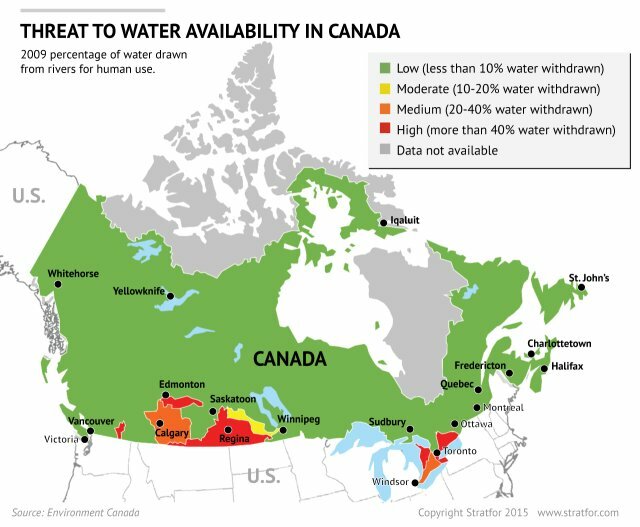 Stratfor's recent report explains how Canada's water abundance is very deceptive because Canada's water is not evenly distributed (60% of Canada's water drains to the north away from populated areas). The prairie provinces of Alberta, Manitoba and Saskatchewan are typically more arid than other parts of the country. An expansion of agricultural and industrial activity in the region, along with population increases in recent decades, has led to greater water stress in parts of these provinces, and the pressure is expected to increase in coming decades. Agricultural and extractive industrial activity can be expected to continue in the region even as existing resources dwindle. Glaciers that feed the headwaters of many of the major rivers in the region have shrunk by roughly 25 percent in the past 100 years. Increasing temperatures and more frequent droughts are predicted, likely further increasing the strain on the water supply.